Be the first to share your favorite memory, photo or story of Al. This memorial page is dedicated for family, friends and future generations to celebrate the life of their loved one. 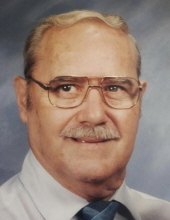 Al Pierce, age 91 of Abilene, passed away Monday, March 18, 2019. Funeral services will be held at 2 p.m., Wednesday, March 20th at Morehart Mortuary with Pastor Allen Pierce officiating. Interment will follow in the Breckenridge Cemetery under the direction of Morehart Mortuary. Alfred Nash Pierce, Jr. was born February 14, 1928 in Flint, Michigan to Alfred Nash Pierce, Sr. and Beatrice Rodenhauser Pierce. He went to school in Nettleton, Arkansas. When he turned 17, Al joined the United States Navy. On September 12, 1945, he was sent to basic training in San Diego and was then sent to Bremerton, Washington and Kodiak, Alaska, where he worked in the naval hospital for two years until his enlistment was up. Al was discharged on December 24, 1948 and was awarded a Good Conduct Medal and a WWII Victory Medal. During the Korean Conflict, he re-enlisted with the United States Air Force and worked in the dental laboratory from 1951 to 1953. He received his second honorable discharge after the Korean Conflict and went to work for General Dynamic Co., which later became Lockheed-Martin, as a machinist until his retirement in 1996. On July 20, 1988, Al married Joyce Hill in Abilene. He was preceded in death by his parents, Alfred and Beatrice Pierce; his first wife, Penny Pierce; three children, and three sisters. Al is survived by his wife Joyce Pierce of Abilene; two children, Allen Pierce and wife Susan of Whiteland, Indiana, Marlina Cowan and husband Ron of Breckenridge; one step-daughter, Allana Gillespie of Abilene; fifteen grandchildren and several great grandchildren and great-great grandchildren. Memorials may be made to the VFW Post 7767 or any veteran charity and may be left at Morehart Mortuary. Condolences may be made online at www.morehartmortuary.net. "Email Address" would like to share the life celebration of Al Pierce. Click on the "link" to go to share a favorite memory or leave a condolence message for the family.